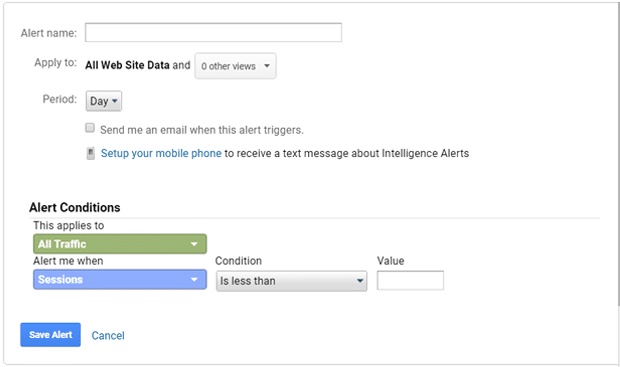 Want to create custom alerts in Google Analytics? The Google Analytics alerts you set up help you keep track of major changes in your website traffic, user interactions, and conversions on your site. Thanks to timely alerts, you can immediately catch and then solve the problems that’re causing harm to your site before it’s too late. In this article, we’ll show you how to create and manage custom alerts in Google Analytics step-by-step. Why Track Google Analytics Custom Alerts? Have you ever noticed a sudden drop or spike in your website traffic? Or, you may have noticed an increase or loss in eCommerce sales, email signups, or forms conversions. Sometimes, such a sudden increase can be fake and harmful to your site unless you’re running a specific campaign. Imagine you’re busy with something more important and weren’t checking your Analytics data for quite some time. Chances are your Analytics reports showed unusual spikes or drops in user interaction but you missed them. When you finally got back, you discovered a massive loss. Google Analytics custom alerts help to prevent such losses. 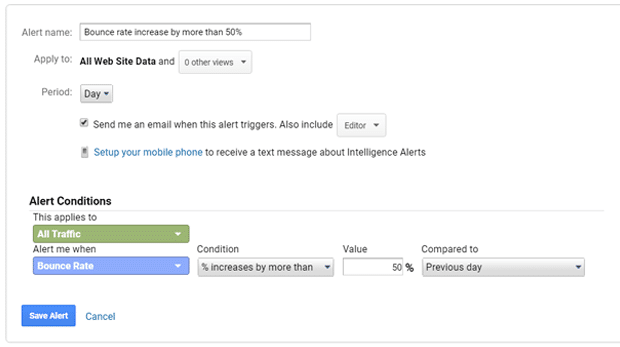 You can set up alerts for certain changes in your Analytics data, so when the reports meet the threshold, Analytics immediately sends you an alert email. Then, you can instantly fix the issues. Google Analytics custom alerts are really useful as they help you to monitor huge changes in your Analytics reports and notify you immediately. Thus, you can instantly investigate and find out what’s causing the changes in your Analytics data. It protects you from some unfortunate conditions like referrer spam, loss in business, etc. Now, let’s go ahead and take a look at the process of creating custom alerts in Google Analytics. To get started, make sure that you’ve signed into your Google Analytics account. Then, navigate to the Admin option at the bottom of your Analytics panel on the left. Upon clicking the Admin option, you’ll see 3 columns of settings there. Go to the View column and scroll down to the Custom Alerts option under Personal Tools and Assets. Click the Custom Alerts. Now, you’ll see your custom alerts overview along with a New Alert button. If you haven’t created any custom alerts yet, you’ll see no items in the list. To create a new custom alert, click New Alert. Then, you’ll see a page where you can add a new custom alert. 1. Alert name: First, enter an alert name. 2. Apply to: Then, choose the proper Analytics account from the Apply to option if you have more than 1 Analytics property. 3. Period: Next, you can select the frequency for the alert from the Period option. You can choose Day, Week, or Month. If you choose Day, it creates alerts based on daily changes in traffic or user interactions. Make sure to check Send me an email when this alert triggers. If you want to send the alert to other members of your team, you can add their email addresses from the Also include option. If you’re in the United States, you can also set up your mobile phone to receive a text message when the alert triggers. This applies to: You can select All Traffic or specific dimensions to which the alert applies. Alert me when: Choose the metric to which the alert applies. Condition: Condition options include Is less than, Is greater than, Decreases by more than, % Increases by more than, etc. If you aren’t sure about the average value of any metric, you can choose % Increases/ Decreases by more than option. Value: Enter the value for the condition. Compared to: If you choose % Increases/ Decreases by more than, you can choose comparing to previous day, week, or year. Once you select all of your alert options, don’t forget to click the Save Alert button. That’s it! You’ve created a new alert in Google Analytics. Now you can create more alerts following the same process. Some of the important alerts can be a drop in sessions by more than 50%, unusual spike in website traffic, decrease in total revenue by more than 50%, etc. Managing Google Analytics custom alerts is as simple as creating one. As discussed above, you can find your list of custom alerts in the Custom Alerts option below the View column inside Admin options. All you need to do to edit a custom alert is to click on its name, then it’ll open the editor. Then, you can make any changes you like. Once editing is complete, don’t forget to click Save Alert. If you’re using MonsterInsights plugin in WordPress for Google Analytics, it provides you with all your important reports right inside your WordPress dashboard. If you’re always working on your dashboard, viewing Google Analytics reports is far easier for you with MonsterInsights’ dashboard reports. With it, you may not even need to create custom alerts! MonsterInsights is the best Google Analytics plugin for WordPress. It makes Google Analytics easy for WordPress users from every aspect. For example, it’s easy to install Google Analytics using this plugin. Setting up advanced tracking like eCommerce, forms, downloads, etc. is very easy as well. And, you can view extremely comprehensive reports directly from your dashboard. If you’re a solopreneur who works within WordPress dashboards most of the time, MonsterInsights’ dashboard reports are the optimal tool for you. But, if you’re working off-site most of the time and rarely log into your WordPress dashboard or Google Analytics account, setting up custom alerts is a perfect solution. 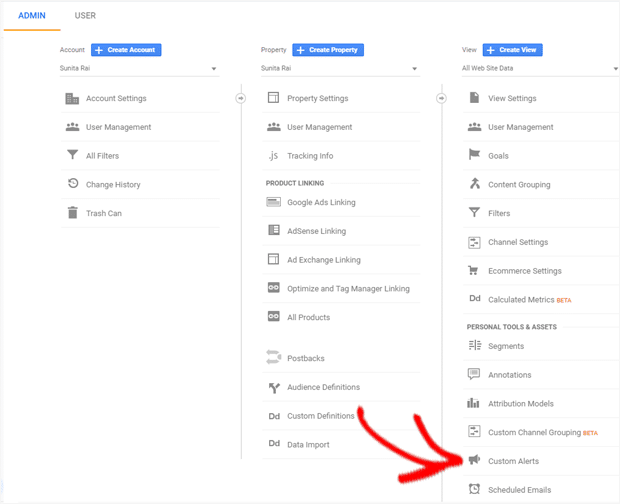 We hope this article helped you to learn how to create and manage custom alerts in Google Analytics. You may also want to see our guide on how to view real-time reports in Google Analytics. Thanks for the informative and useful tip. Thanks, Amiyo! Glad to know it helped!